100 blocks made and shared through Instagram in 100 days. 75 blocks all set together without sashing. Yellows, grays, whites and elephants blending together. Asymmetrically framed with a slate gray solid and backed with flannel. Stitched with organic wavy lines. The binding is slate gray except for a 18'' section (upper right) which is bound in scraps of yellow. Looks perfect on my daughter's bed in her newly painted room. We took the quilt for a photo shoot at our neighborhood playground - a place she hadn't been too since she was ten. For my quilt, I used this FQ bundle of Pastel Pop by Michael Miller which was sitting in my stash. 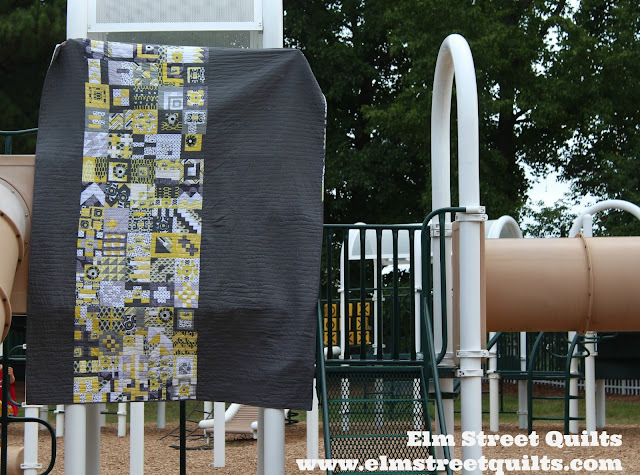 I'll be linking up my quilt Playful with Freemotion by the River, WIP Wednesday's, Let's Bee Social, Midweek Makers. Needle and Thread Thursdays, Finish it Up Friday and Finished or Not Friday. It looks great! Love the colors. I love how it came together! Do you have plans for the other 25 blocks or did I just miss that in the Post? Well done! I don't think I could get into my sewing room 100 days in a row - though I WANT to! The quilt looks wonderful on your daughter's bed, and I personally think the purple window trim really sets it off! Wow! The quilt looks terrific. I got some scraps of this fabric at a destash sale on Saturday. Nice big chunks, but not enough to make a quilt, though. Awesome! Love how you set the blocks.